Applications as disparate as multimodal imaging and deep-tissue studies benefit from higher peak power and other new performance benchmarks for one-box lasers. Nonlinear microscopic imaging techniques are playing key roles across many areas of life sciences research because they can perform high-resolution, three-dimensional spatial imaging of specific chemical targets (labeled and unlabeled) in real time and in living tissue. 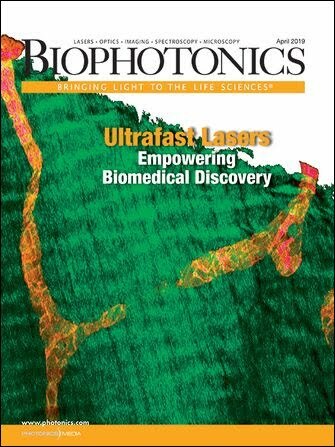 In turn, laser manufacturers have simplified these techniques and broadened access to them by developing “one box” ultrafast lasers that provide turnkey operation for microscopy. At first, the emphasis of these lasers was to deliver high value through ease of use and performance flexibility. But we are now seeing an increase in laser diversity to offer the highest possible performance on several fronts – for example, to support researchers who demand the very longest wavelength possible, or the highest peak power or the highest power in the near-infrared (out to 1.6 µm). Consequently, to select the best laser for a particular application, it is vitally important to understand how performance is defined. The latest one-box Ti:sapphire (Ti:S) lasers provide a tuning range as wide as 680 to 1080 nm, usually with push-button control to maximize their flexibility (Figure 1). This enables the laser wavelength to be easily tuned to the needs of quite different experiments, or to multiple fluorophores used in the same experiment. Figure 1. The wide tuning range of one-box Ti:sapphire lasers provides maximum flexibility, particularly for multiple users. This is the typical output tuning curve for Coherent’s Chameleon Ultra. Courtesy of Coherent Inc.
Power in microscopy lasers is usually expressed as time-averaged output power. As shown in Figure 1, the gain of Ti:S varies with wavelength, with peak output efficiency at roughly 800 nm. Currently, one-box Ti:S lasers optimized for high power (e.g., the Chameleon Ultra) can deliver more than 3.5 W. Average power is important because it enables images to be obtained in a shorter time, supporting faster frame rates for dynamic imaging. High average power is critical also for deeper imaging and for reaching the long-wavelength “tail” of the Ti:S gain curve to 1080 nm. The other key laser parameters are peak power and pulse width. In practice, the shortest pulse width is obtained by using a cavity designed for short pulse width and cavity optics that precisely compensate for group velocity dispersion (GVD). The bane of ultrafast lasers and their users, GVD is a quantitative expression of the fact that, in any transparent material, there is dispersion; the speed of light is wavelength-dependent. This dispersion must be compensated using optics so that all the different wavelength components that make up the short pulse have exactly the same round-trip time in the laser. Currently, one-box lasers optimized for short-pulse performance (e.g., the Chameleon Vision S from Coherent) deliver pulse widths as short as 70 fs. So, for a given laser power, shortening the pulse width increases the peak power, and the efficiency of multiphoton excitation is a nonlinear function of peak power. In addition to considering these laser parameters, it is also important to understand the role of a couple of useful accessories that can modify performance in two key ways: GVD precompensation and a tunable optical parametric oscillator (OPO). Before it reaches the sample, the laser pulse has to pass through several beam delivery optics as well as the microscope optics. All of these have dispersion and create GVD, thereby broadening the pulse in time. This is particularly problematic if the microscope contains one or more acousto-optic deflectors, which tend to be highly dispersive. There are two ways to address this issue – passive and active. The simplest (and lowest cost) solution is to design the laser pulse width for an optimum value to match the GVD of the most common microscopes. With very short pulses, their high bandwidth means that they experience substantial broadening and can be quite long at the sample, reducing their peak power. Conversely, very long pulses experience less broadening because of their reduced spectral bandwidth. But these pulses start off long and cannot be shortened beyond that initial pulse width. So the trade-off between initial pulse width and minimizing acquired GVD means that there is actually an optimum laser pulse width of 130 to 160 fs that produces minimal pulse width at the sample for the most common multiphoton excitation microscopes. A more rigorous approach is to use an optical accessory that imparts negative GVD to the pulse leaving the laser, to counter the positive GVD of the downstream optics. This is often integrated completely within the laser, as this maximizes beam pointing stability. Also, for maximum flexibility, it’s better to use a precompensator with a wide dynamic range that can be smoothly adjusted from zero to a value high enough to compensate for the most dispersive microscope – for example, one with twin acousto-optic deflectors. In addition, this enables wide pulse duration flexibility for optimized performance in quite different experiments. An OPO can shift the Ti:S laser output to a longer wavelength, providing continuously tunable coverage over the 1- to 1.6-µm spectral region for deep-tissue imaging, for example. The OPO’s automated frequency doubling and tripling options also enable this accessory to provide tunable visible pulses, including complete coverage over the Ti:S gap from 540 to 680 nm. In addition, the latest generation of OPOs uses a fan-poled nonlinear crystal. Unlike OPOs based on earlier bulk crystals, a fan-poled crystal can be pumped with a broad range of wavelengths. This means the output of the Ti:S laser and the OPO can be independently tuned (Figure 2). This innovation enables simultaneous excitation of two very different fluorophores as well as multimodal imaging studies, using all the different types of nonlinear imaging techniques, including coherent anti-Stokes Raman scattering (CARS), second- and third-harmonic generation imaging, and multiphoton excitation. Figure 2. Fan-poled crystal technology provides independent tuning as summarized in this graph, which shows the combination of simultaneous tuning ranges provided by a Ti:sapphire laser and a fan-poled optical parametric oscillator. (Chameleon™ Vision and Chameleon Compact OPO). Courtesy of Coherent Inc.
All commercial one-box lasers feature a reasonable tuning range and beam quality, so choosing a laser model comes down to setting priorities for the parameters where cutting-edge performance is most important. Figure 3. Long-wavelength excitation is critical for deep-tissue imaging, as illustrated by this image of mouse brain capillaries extending to a depth of 250 μm. The image was recorded with 1080-nm excitation using an Olympus objective and Coherent Chameleon Vision. Courtesy of Dr. Hiroyuki Kawano, Professor Atsushi Miyawaki Lab, Laboratory for Cell Function Dynamics, Brain Science Institute, Riken Institute, Japan. The primary reason for prioritizing long wavelength is for deep live-tissue imaging. Whether it’s to study some aspect of morphogenesis, to model ischemic strokes or to study the murine cortex, live-tissue imaging is characterized by the following: the need to minimize photodamage, the drive for deeper and faster tissue imaging, and the need for higher signal-to-noise ratios. While the debate about optimum pulse width and peak power continues, virtually everyone agrees that all of these goals can be better met by ultrafast laser sources that deliver longer wavelengths, close to or beyond the limit of Ti:S lasers, and that produce relatively high powers at these long wavelengths. The use of longer (up to 1080 nm) wavelengths results in reduced scatter losses and minimized photodamage, enabling deeper imaging. Specifically, because of the homogeneous nature of biological samples, the majority of light scatter scales nonlinearly with wavelength (specifically, 1/λn), so even modest increases (by tens or hundreds of nanometers) in the excitation wavelength can lead to significantly less scattering, which has proved to be a limiting factor in deep-tissue imaging. This depth is further extended with GVD precompensation (Figure 3). The advantage of being able to optimize the pulse width at the sample by GVD precompensation is illustrated in Figure 4, which shows two images (with and without optimized laser precompensation) at a depth of 140 µm in a pituitary gland sample labeled with green fluorescent protein and excited at a wavelength of 930 nm. Figure 4. Two images of a pituitary gland sample labeled with green fluorescent protein show the effects of optimized group velocity dispersion precompensation (left) versus no precompensation (right). Images recorded with a Zeiss LSM 7 MP microscope and a Coherent Chameleon Vision laser. Courtesy of Jean-Michel Lago, Carl Zeiss sas. The main reason for emphasizing high power is to increase the efficiency of nonlinear processes, particularly the OPO at longer wavelengths, i.e., closer to 1.6 µm. The primary drivers are the widest wavelength flexibility for multiple users as well as groups performing multimodal imaging, including CARS, second- and third-harmonic generation imaging, and multiphoton excitation. These techniques are all optimal for imaging different types of structures and molecules. For example, CARS is often the best method for imaging lipids with a typical spectroscopic interval of 2840 cm–1 to detect C-H stretching vibrations. Multiphoton excitation, on the other hand, is ideal for exciting fluorophores as well as for endogenous fluorescence to map the fate of genes and their protein products. And second- and third-harmonic generation imaging methods are well-suited for imaging membranes as well as collagen and muscle fibers and also can be used for some lipids. A typical user in this category is professor Ji-Xin Cheng’s group at Purdue University in West Lafayette, Ind., which uses multimodal imaging, including CARS, “to enable label-free biological imaging based on the intrinsic signals from molecular absorption and bond vibration,” according to the university website describing his work (Figure 5). Figure 5. Multimodal coherent anti-Stokes Raman scattering/two-photon fluorescence image, recorded with Coherent Chameleon Ultra and OPO, of Drosophila larval fat body. Courtesy of Mikhail Slipchenko (Ji-Xin Cheng lab) and Wei Dou (David Umulis lab) of Purdue University. In microscopy applications, shorter pulses deliver higher peak power for brighter images from second- and third-harmonic generation imaging as well as multiphoton excitation. The impact of shorter pulses can be understood by comparing two different Coherent lasers, both featuring precompensation. The first is optimized for shorter pulse width and delivers an average power of more than 2.3 W, while the second laser, optimized for other parameters, can produce up to 3.0 W. While this is a difference of only 20 percent in average power, the pulse width of the first laser is 70 versus 140 fs for the second laser, resulting in a 50 percent increase in peak power. Who should prioritize short pulse width? This is a somewhat contentious issue. With fixed tissue, the answer is simple: anyone who is dealing with potentially very weak images – for example, deeper images based on third-harmonic generation. With living tissue, there are two schools of thought. Some researchers prefer very short pulse widths because this undoubtedly increases signal strength, which scales as peak power2 or even peak power3, for three-photon effects (multiphoton excitation, third-harmonic generation). But others claim that since tissue damage also scales as a high order of the laser peak power, shorter pulse widths are not an advantage, and they believe that adjustable average power is a more important feature. The success and growth of nonlinear imaging techniques have been enabled by turnkey lasers that offer users maximum flexibility. But, as researchers refine these techniques, continued progress will require lasers that push the limits of performance, without sacrificing reliability or ease of use. David Armstrong is product line manager at Coherent Inc. in Glasgow, UK; e-mail: david.armstrong@coherent.com.